Google Sketchup is 3D design software that allows you to visualize what a landscape design would look like. It is not only easy to use, but a lot of fun to see a design come to life. This software is now simply called Sketchup. In 2012 it was purchased by Trimble. There are many tools to use to help you draw your vision. The software is free, but there is also a Pro version which has some advanced tools. For homeowners, the free version will work just fine. 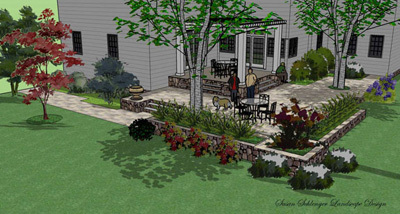 There are many other 3D landscape design software programs available also. They all work a little differently from each other. Some are simple and some are more advanced...the more advanced the 3D software is, the more time it will take to create a design. In the free Sketchup, there are different types of views for you to draw from. You can choose to start drawing directly in 3D. You can begin in plan view, which is a flat 2D view. If you want to draw in elevation, such as looking at the front of your house, you have four different choices...front, back, right side or left side. If you are drawing in any view but 3D, you have to eventually add the detailed dimensions. Drawing the front elevation does not show how deep your house is, any sections that are set in or go out, or side and rear details. You will have to add this information. So typically drawing in 3D with Google Sketchup is the best way to work. There are 3D guidelines designated by colors to help you. Sketchup makes drawing simple. The push-pull tool lets you pull a form out to an exact depth. There is a tape measure to measure lengths and widths. The rotate tool lets you slowly rotate your design to view it from different angles. You can copy and move objects, magnify areas, and pan around the screen. There are circle tools, arcs, text tools, and so on. If you want to see what your patio looks like in brick, just look for a brick you like in the materials library. If you want to see it in bluestone instead, you can change it with a click of a button! There are different materials to choose from, such as stone, wood, tile, solid colors, asphalt, concrete, ground cover, etc. You can change the color of the materials or adjust the scale. For example, if you find a stone you like, but not the color, just change it! If the stone pieces are too large, you can make them smaller. I'll be honest. I really enjoy working with Sketchup, but adding the components are the icing on the cake. 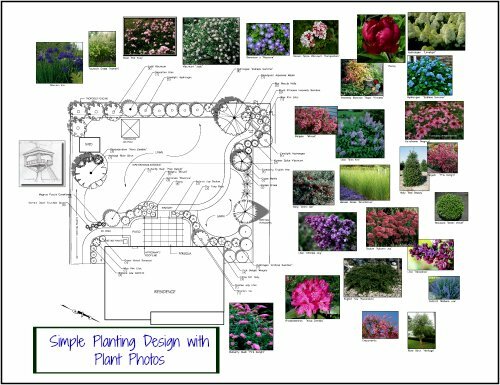 Here is where you can add plants, people, cars, grills, dogs, pergolas, garden ornaments, and on and on. There are free Sketchup models (components) in the software. However, you can explore Google Warehouse (which is free) for anything you might not find. You can even adjust the components by exploding the parts, resizing them, or adjusting them as you like. You can change the color of plants and also make them a certain size. Here is one of my designs, showing the plants and also an outdoor kitchen island, which I downloaded from Google 3D Warehouse. I also modified the kitchen as mentioned above. You can pause the video anywhere to take a closer look. For a nice 3D portrayal, you can use the plant components offered in the Sketchup software. 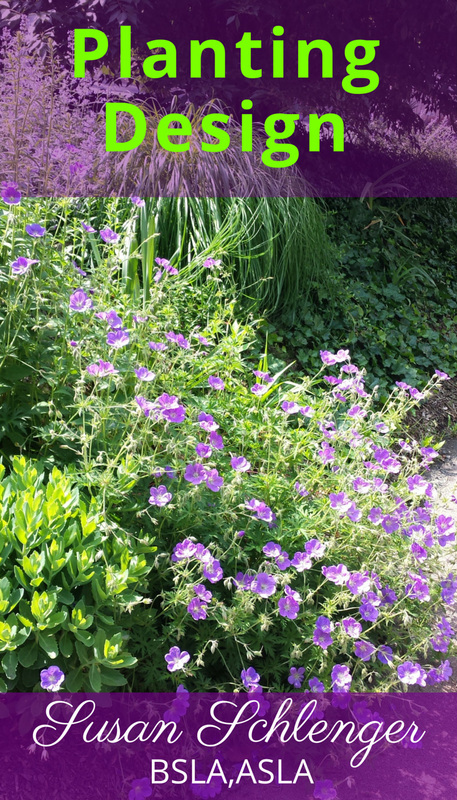 However, Entourage Arts has some beautiful plant components which you must buy. I use these in all of my 3D drawings. Also visit these related pages! This is a very interesting feature. You can import a photo, such as your house and property. By copying/drawing the lines of your house, you can have a replica of the photo and design your landscape. There are many other features. The more you explore, the more you will come to know the program and all that you can do with it. YouTube has many excellent Google Sketchup tutorials.